Ambassador to the UN Danon explains why Israel visit by 11 ambassadors is so important, claiming they will not be deceived easily anymore. Israel's Ambassador to the UN Danny Danon expressed great satisfaction with the visit to Israel he led in which 11 UN ambassadors representing countries from four different continents had the opportunity to observe life in Israel for themselves. "It was a very effective visit. 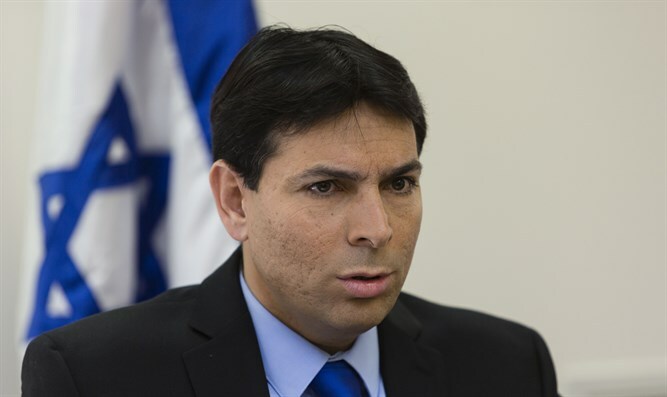 We managed to show them the chief challenges we're dealing with in only four days," Danon told Arutz Sheva. Danon recounted that the ambassadors first visited the border with Gaza, where they saw the threat of the rockets and tunnels, and then went north to the border with Lebanon, in order to observe the threat posed by a rearming Hezbollah. Danon showed the ambassadors maps of the various Hezbollah bases that are located in the heart of local villages very close to the border, complete with rocket launchers. Ambassador Danon claims that there is no doubting the effectiveness of these types of visits and tours. He says that it's not a matter of gaining victory in a knockout blow but rather gaining "points" little by little, with the fruits of these efforts becoming apparent in future diplomatic struggles. Danon said that the maps and pictures he showed the ambassadors are of great value in rebuffing baseless criticisms of Israel, and that if he could he would bring all the ambassadors in the UN for a similar visit. When asked whether any of the visiting ambassadors hailed from countries that are consistently anti-Israel, Danon replied that most of the countries were what he would call "middle-of-the-road" regarding their Israel policy, and that the great advantage in bringing their ambassadors over for a visit is in the fact that it makes it far less likely that they will turn anti-Israel in the future, as they have seen the facts on the ground first-hand, and aren't just getting their information from pro-Palestinian propaganda. Among the accusations Israel needs to defend itself from in the international sphere are what Danon calls "crazy" accusations that are often quite separate from the constant harping on the Palestinian Arab issue. One accusation that is expected to come up soon in the UN is a Syrian claim that Israeli residents of the Golan Heights are subject to oppression from the government of Israel, and thus would fare better under Syrian rule. This kind of claim is revealed as obviously delusional when one visits the Golan and speaks to its Jewish and Druse residents about their lives. The 11 ambassadors then traveled from the north to Ramallah to meet with PA Chairman Mahmoud Abbas. They then met with Danon and Prime Minister Netanyahu and told them what they had heard in Ramallah. Abbas had explained to the ambassadors that he opposed direct negotiations with Israel because he thought a more stable and lasting resolution would be achieved by pressure from the international community and the posting of international forces to the region. Danon and Netanyahu reminded the ambassadors of what they had seen of the history of UN forces in the Syrian Golan and in southern Lebanon, where they had retreated the moment there was a whiff of trouble, thus serving as examples of what would happen in the future should Israel rely on international bodies. As to the matter of the funneling of millions of dollars to fund Hamas terror through the human rights organization "World Vision", a story that broke during the ambassadors' visit, Danon said that this revelation had an effect on the ambassadors, who saw that a human rights organization had been "hijacked" by Hamas. Ambassador Danon projects that his work with the ambassadors who took part in the visit will become somewhat easier from now on, both because of the enhanced personal connection that comes with spending so much time traveling together, and the fact that they have seen many of the important facts on the ground for themselves. As an example, Danon mentioned an American ambassador who had visited Israel in the past, and how, when subsequently, there was talk about supplies going in to Gaza, he was able to remind her of the trucks that she saw in the Kerem Shalom crossing, and the weapons-smuggling efforts Israel has to deal with.